A recently refurbished, spacious, single storey cottage set in a peaceful wooded valley just outside the pretty village of Stoke Rivers. 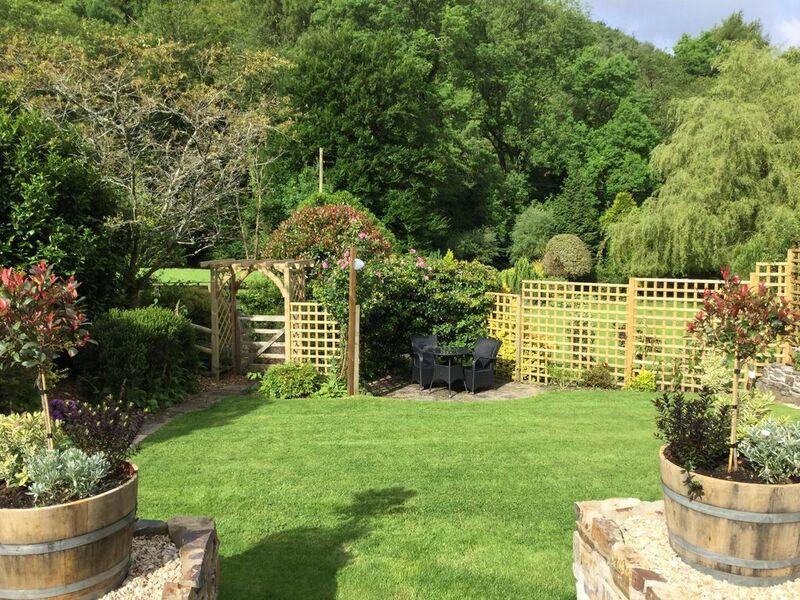 Hakeford Lodge provides quality accommodation perfect for couples and is an excellent base from which to explore beautiful North Devon, from the wilds of Exmoor to the many unspoilt beeches of the North Coast. It has a light and airy open plan living space, with stylish decor and comfortable sofas urging you to sit down and relax. After exploring for the day, enjoy an evening in infront of the living flame fire and watch a film on the large flat screen Smart TV. There is a Bose sound dock, DVD player, cards and board games too. The modern kitchen area is well equipped with electric oven, microwave, induction hob, full size fridge/freezer, dishwasher, washing machine, tumble dryer and a Nesspresso Citiz coffee machine. The bedroom is luxurious and comfortable with a king size bed, sumptuous down duvet, a selection of pillows for your personal comfort, Egyptian Cotton linens and fluffy robes. The en-suite bathroom is split level with underfloor heating and offers a large bath, ideal for a long soak, a generous sized separate shower, heated towel rail and large fluffy towels. Outside, the Lodge has its own pretty garden and parking space. Steps lead down from the patio onto a lawn and further private suntrap patio complete with comfortable dining furniture and gas BBQ. The Lodge is attached to the owners house, but privacy is assured at all times. Terry and I moved here three years ago from Buckinghamshire where we'd spent our entire lives. Joined by my grown up daughter Gem and our Springer Pearl, we escaped to the country and away from the busy South East. Having scoured many other counties with our wish list in hand, we finally settled on North Devon for it's unspoilt and not quite discovered yet feel, it's friendly folk who always have time for you and of course the wonderful countryside and coastline. We haven't looked back! We chose Hakeford for it's rural, yet easily accessible location (we didn't fancy negotiating very narrow lanes every day!) We hope holiday guests will also appreciate the ease of which they can to and fro whilst exploring this beautiful part of the country. We are approximately 4 miles from Barnstaple town. There is a bus stop a short walk away but services are limited. To make the most of a stay with us,a car is essential. Body boards available to borrow on request. PRICES for SHORT BREAKS are NOT always correct. Please enquire. SHORT BREAKS. Prices for short breaks are as follows 3 nights charged at 30% off the weekly rate 4 nights charged at 20% off the weekly rate 5 nights charged at 10% off the weekly rate Prices are not calculated on the nightly rate shown in the table. 50% of rent is required at the time of booking if 6 weeks or more in advance, with the balance due 6 weeks before arrival. Bookings made less than 6 weeks before arrival, will be required to be paid in full at the time of booking. We also require a £100 refundable damage deposit to be paid 10 days prior to arrival.